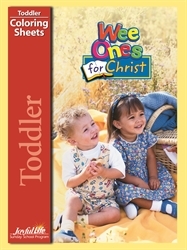 The individual weekly coloring sheet coordinates with the Bible story. The Coloring Sheets book includes stickers which the children will enjoy adding to many of the coloring sheets. The Coloring Sheets book also contains individual Attendance Charts (inside back cover) and Stickers (center insert) to be pulled out and kept separately. As each child arrives, he places the sticker on his attendance chart. The attendance charts may be used as a bulletin board or wall decoration.